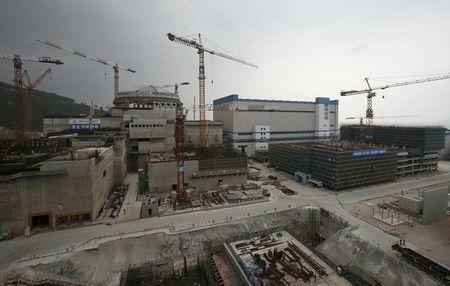 WASHINGTON (Reuters) - China remains committed to its plans for nuclear reprocessing, its top nuclear industry official said on Thursday, despite concerns this could lead to a competitive buildup of plutonium stockpiles in Asia. "China is dedicated to the establishment of a complete nuclear fuel-cycle system," Xu Daxhe, chairman of the China Atomic Energy Authority, told reporters on the sidelines of the Nuclear Security Summit in Washington. "When we are constructing a number of nuclear power plants in China we are also taking into consideration the development of a reprocessing capability," he added. Xu noted that China was in discussions with French firm Areva over the construction of a commercial reprocessing plant, although he added that there was still "a long way to go to complete the negotiation, both technically and commercially." Speaking at a news conference earlier, Xu reiterated concerns about the size of the plutonium stockpile possessed by Japan, which plans to open its own reprocessing plant in 2018. "There is a mismatch between the current stockpile of the plutonium in Japan and its real need for development," Xu said. Japan has an estimated 50 tonnes of plutonium, enough to produce 2,000 nuclear weapons, and is building a large plant at Rokkasho in northern Japan to reprocess spent fuel from power plants, although its start has been repeatedly delayed. It has until now relied on the British and French to extract plutonium from spent uranium fuel rods, but with nearly all of its reactors shut down after the Fukushima nuclear disaster five years ago and no schedule for further restarts there is little use for the material. Japan remains an avowedly anti-nuclear-weapons state as the only country ever to have suffered a nuclear attack. However, anti-proliferation advocates worry that if it goes ahead with plans to open Rokkasho, this will raise fears about its future intentions, spurring China's plans and also encouraging South Korea to pursue reprocessing capability. U.S. concerns had been rising about the prospect of growing stockpiles of nuclear raw materials in East Asia and in mid-March, Thomas Countryman, an assistant U.S. secretary of state in charge of non-proliferation, called into question the renewal of an agreement between Washington and Tokyo that allows Japan to reprocess and produce weapons-grade plutonium. The agreement is due to be extended in 2018, but with a new U.S. administration starting in January its status is unclear.